Holmes is an associate professor at the School of Journalism and Communication at Carleton University. She worked in the Yukon (radio and television) with CBC North. Holmes dreamed up Stories North as a way to get students out of a conventional classroom and to educate emerging journalists about Canada's North, Indigenous history and culture. Stories North is a direct response to Canada's Truth and Reconciliation Commission and its calls to action directed at transforming curricula at journalism schools. Connect with her at kanina.holmes@carleton.ca. Taylor is in her final year of her undergraduate degree at Carleton University, double majoring in journalism and political science. Her studies allow her to use storytelling to bridge the gaps between the lives of Canadian citizens and policy making at federal, provincial or municipal levels. Connect with her by email at taylor.blewett@carleton.ca or @tayblewett on Twitter. Amy is a linguistics student at Carleton University. Stories North is giving Burlock the opportunity to go beyond her written based research and delve into the wide world of journalistic mediums. Burlock hopes to use her background in linguistics to learn about the cultural roots of language among the Yukon’s Indigenous communities and the work being done to preserve these unique languages. Connect with her by email at amyburlock@cmail.carleton.ca. Brieanna is a Master of Journalism student at Carleton University. She is currently working on her Master’s Research Project which focuses on deradicalization. Brieanna has two previous degrees; a Bachelor of Psychology from Ohio University and a Bachelor of Journalism from the Scripps School of Journalism. You can connect with her via email at brieannacharlebois@cmail.carleton.ca. Amy is in the final year of her bachelor in journalism and communications at Carleton University. Her journalistic interests have evolved into specialized mediums including radio broadcasting and in-depth reporting. Amy joins Stories North in hopes of bettering her ability to cover journalistic stories involving Indigenous affairs as well as political and gendered issues. Connect with her at AmyCook3@cmail.carleton.ca. Rachel is in her final year of her undergraduate degree at Carleton University, majoring in journalism with a minor in history. Dale joined our team for Stories North out of a belief that this experience will reinforce her love for story telling and open her eyes for future journalistic ambitions. Rachel can be reached by email at racheldale@cmail.carleton.ca. Petra is a soon-to-be graduate of Carleton University’s bachelor of journalism, minoring in French. She is a passionate globetrotter who jumps at every opportunity to learn and explore. When she isn’t busy planning her next adventure, she likes to look at the world through her camera lens. She is excited to develop her skills and strengthen her storytelling abilities through photography and videography while in the Yukon. You can connect with her by email at petronelladuda@hotmail.com. Liam is a masters Journalism student at Carleton. He spends most of his time outside, although he burns easily and tends to get lost. Good thing Paddington Bear taught him to always keep a sandwich under his cap. Liam went to the Yukon many moons ago and has always wanted to come back. The North gets under the skin and keeps itching until you return. This trip should reduce his weekly spending on Gold Bond. Connect with him by email at liamharrap@cmail.carleton.ca. Rachel is currently working towards her childhood dream of becoming a journalist. She loves learning, but her favourite subject is people and the amazing stories that they have to share. Contact her via e-mail at rachel.levy.mclaughlin@gmail.com. Michael is a fourth year journalism student with a minor in French. He has always had a love for writing and a passion for cooking - hoping to someday combine these two interests into a career. Michael is excited to strengthen his digital story telling skills for future journalism pieces. If you have any recommendations on stories about food give him a shout at michaelamackinnon@cmail.carleton.ca. Sandrine is a fourth year journalism student at Carleton University whose passion is rooted in history. And if journalism is history's first draft, then all the more reason to be one of its writers. With Stories North, she hopes to see and write about the path of reconciliation with a careful understanding of a historical past marked by pain and loss. Throughout Stories North, Sandrine is looking for the chance to combine history and currency in a comprehensive multimedia piece using a collection of historical images to contrast the ‘then and now’ of Canada’s history and highlight the path it’s taken in reconciliation. Contact Sandrine at sandrinemurray@cmail.carleton.ca. 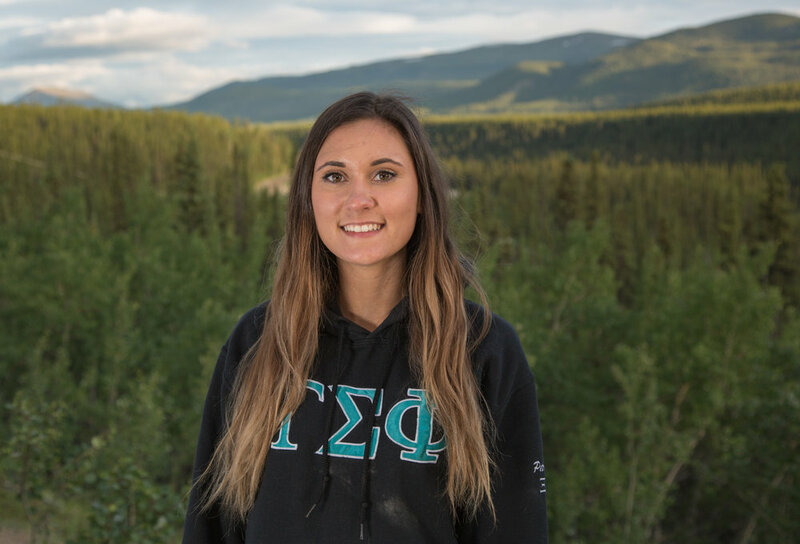 Sabrina is a master of journalism student at Carleton University, currently working on her Masters Research Project on the effects of river piracy in the Kluane Lake area. Her love of maps, animals, hiking and history falls perfectly within the course experiences designed for Stories North. She writes, she tweets, she travels and she’s deathly afraid of Australia. Connect with her by email at sabrinanemis@gmail.com or @sabrinanemis on Twitter or Instagram. Brooke just graduated from Carleton University's Bachelor of Journalism program. She loves videography, digital storytelling, doing yoga and is passionate about anything to do with music. Following her adventures in the Yukon, will be starting up her future career with OPIN Software as their Marketing Coordinator. If you want to get in touch with her, shoot her an email at brookepeloquin@hotmail.com or follow her on twitter @brookepeloquin. Jasmine is a journalism student at Carleton University with a passion for story telling. Sikand, who’s most often found in the outdoors, listening to R&B, while doing tarot card readings, is a firm believer that the universe will work itself out and lead her from place to place. She loves sharing and learning about experiences that make us each unique. With a strong passion for photographic storytelling, Stories North will give Sikand the opportunity to develop these skills. Find her on Twitter and Instagram @jasminesikand or message her by email at jasmine.sikand@hotmail.com. Thamar is a fourth-year journalism student After making Ottawa her hometown she discovered her love for sharing stories. She’s up North exploring the true Canadian narrative and the diverse relationships Canadians have with one another. Connect with her by email at thamarspitzer@gmail.com. Sidney is a journalism student at Carleton University who enjoys music, the outdoors and spending time with friends over a cup, or four, of coffee. Sidney brings a love for learning new things about the world and its people to our team for Stories North, always open to learning and to listening. Sidney can be reached by email at sidney.weiss123@hotmail.ca or @sidweisss on Twitter. Beairsto is a Masters of Journalism student at Carleton University. She was born and raised in the Yukon with a gaggle of brothers and dogs. History nerd, anthropology buff, long-time lover of the written word. Beairsto loves the absurd in life and in people. This opportunity to welcome and work with newcomers to the Yukon has been a dream. Her current work looks at how we remember the Alaska Highway. Contact her at bronwyn.beairsto@gmail.com or on Twitter @BronwynBeairsto.